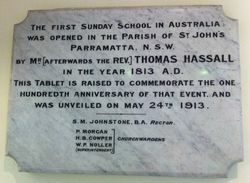 The plaque commemorates the 100th anniversary of the first Sunday School in Australia. 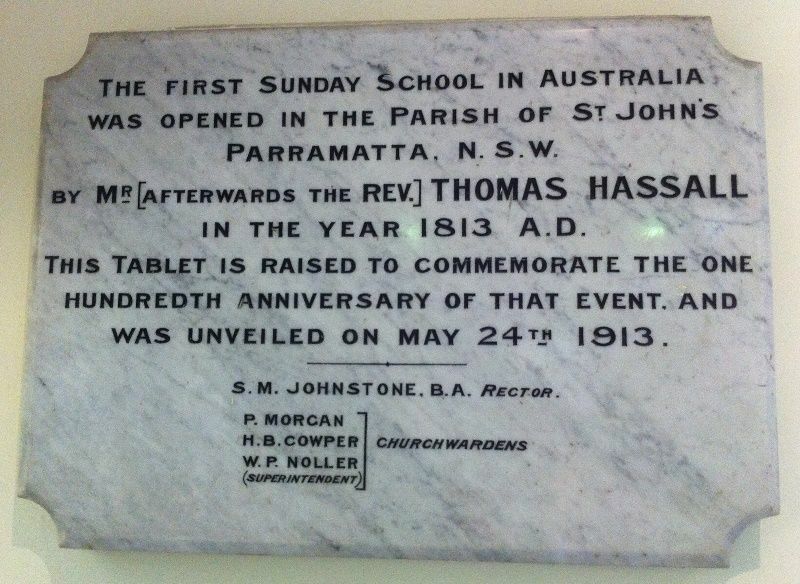 A significant event in the life of St John’s was the commencement of Australia’s first Sunday School in 1813 by Mr. (later Reverend) Thomas Hassall in the house of his father Rowland Hassall on the corner of George and Charles Streets, Parramatta. 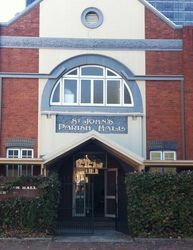 The First Sunday School in Australia was opened in the Parish of St. John`s Parramatta, N.S.W. by Mr. (afterwards the Rev.) Thomas Hassall in the year 1813 A.D. This tablet is raised to commemorate the 100th anniversary of that event, and was unveiled in May 24th. 1913.